Brody Roybal (Northlake, Ill.) registered a goal and an assist and five other players tallied a point but the U.S. National Sled Hockey Team fell to Canada, 4-3, here today in its first game of the 2019 Sled Series in Indian Trail, North Carolina. 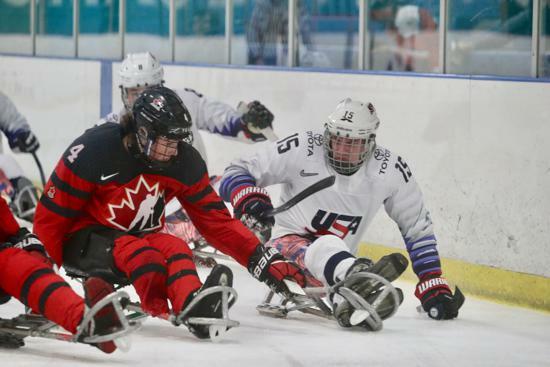 "I thought we played real well at times, but it wasn't enough and credit to Canada for capitalizing on their chances," said David Hoff , head coach of the 2018-19 U.S. National Sled Hockey Team. "It was one of those back-and-forth games that could've gone either way and unfortunately we ended up on the losing end. We'll regroup tonight and turn our attention towards a real strong finish tomorrow." The U.S., which suffered its first loss of the season (5-0-0-1/W-OTW-OTL-L), will look to rebound tomorrow, March 23, when the two teams meet. Puck drop is slated for 4 p.m. ET here at the Extreme Ice Center and will be broadcast live on HockeyTV. The game opened with an action-filled first period that ended with the U.S. taking a 2-1 lead into the intermission. Canada opened the scoring when Corbyn Smith snuck a shot past U.S. goaltender Jen Lee (San Francisco, Calif.) 5:52 into the frame. In search of a tying goal, Declan Farmer (Tampa, Fla.), Noah Grove (Frederick, Md.) and Kyle Zych (South Hadley, Mass.) were able to sustain pressure deep in Canada’s zone and create a flurry of chances with six minutes to play in the period. The trio’s best chance in the minute and half of the possession saw the puck slip just out of reach with Grove alone at the top of the crease. At the 10:58 mark and with the U.S. on the power play, Jack Wallace (Franklin Lakes, N.J.) took a pass from Roybal and beat Canada’s Dominic Larocque to even the score, 1-1. Less than two minutes later, Roybal made it 2-1 for the U.S. when he cut through Canada’s defensemen and skated around Watson for a tap-in goal. The middle frame saw both teams generate scoring chances to open play before Canada’s Tyler McGregor evened the score, 2-2, 5:56 into the stanza. Less than a minute later, Farmer nearly regained Team USA’s lead when he collected a stretch pass at Canada’s blue line, skated in on goal and fired a shot towards the right corner that Watson turned away. With 6:31 left in the period, Dominic Cozzolino tucked a low-range shot under a screened Lee to give Canada a 3-2 lead. Canada doubled its lead five minutes into the final frame when Liam Hickey connected off a pass from Greg Westlake. With 5:55 to play in regulation, Luke McDermott (Westerlo, N.Y.) connected to cut Team USA’s deficit to one. The play started with Chris Douglas (St. Cloud, Fla.) creating a turnover in Canada’s zone that Rico Roman (Portland, Ore.) was able to collect and dish towards the slot where a diving McDermott was able to redirect beneath Watson’s sled. Despite controlling play in the final five minutes, including another close-range attempt from McDermott and pulling Lee in favor of an extra attacker, the U.S. was unable to even the score and fell, 4-3. 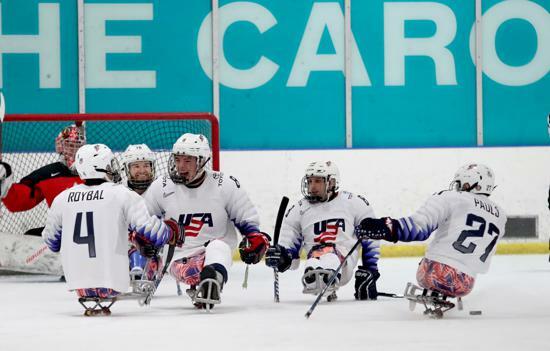 NOTES: Labatt USA and Toyota are proud sponsors of the U.S. National Sled Hockey Team ... Both the U.S. National and Men's Development Team practices will be open to the public at Extreme Ice Center (N.C.) and Ford Ice Center (Tenn.) ... 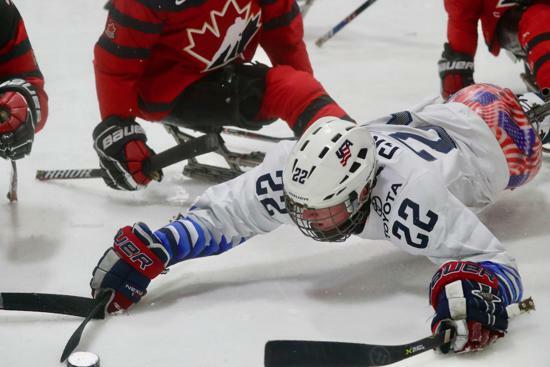 Following the series, the United States will return to Indian Trail, N.C., from April 11-14 for its final training camp ahead of the 2019 Para Ice Hockey World Championship ... For complete coverage of the U.S. National Sled Hockey Team, click here.